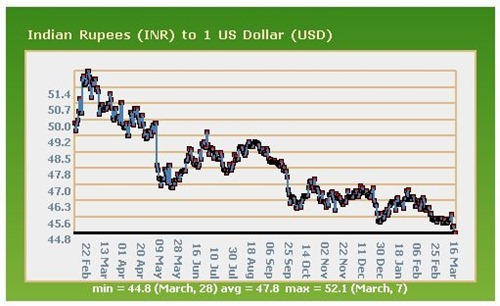 Rupee has again started scaling heights that we saw in 2007 & early 2008. I have been following Rupee Dollar exchange rates closely for a while now, and from what I can see 2010 mat well see rupee breaching the Rs. 40 mark once again. Like I have mentioned before, Rupee is inversely proportional to Stock Market, which in turn is linked with the Economy at Macro level. Things are looking up for India in all major sectors, and 2010 promises to witness 8% + GDP growth. Last 18 – 24 month were a blip in India’s growth path on back of Global recession, but I think we are back on track now. Coming back to Rupee – Many people have asked me that rupee has now breached Rs. 45/- mark against the dollar – Should we expect that Rupee will touch Rs. 40 mark in near future (6 – 12 months). I do NOT have the answer ! But let me try and present you with current situation and reason why Rupee has suddenly strengthened so much. Yesterday, rupee hit a high at 44.94 to the dollar and ended at 44.96, an 18-month high. It gained 0.6%, or 28 paise from its Friday close at 45.23. This Rupee rally is mostly due to Foreign funds pouring into Indian markets. 2010 has seen good inflow of FII (Foreign Institutional Investors) money into Indian stock markets, due to which markets are at their peak since Feb 2008. March itself has seen close to $4 billion dollars of FII money, which is one of the best months in recent times. Contrarily, Dollar has weakened against most other currencies worldwide in last couple of days. Another factor, which is very important for growth is the political stability. India for the first time in last 10 years looks politically stable with current government bringing in more open and market friendly policies. This has given confidence to FII’s in India story, which turn in reflecting well on Indian currency. I am not sure about what will happen to rupee in next 6 – 12 months, but I can tell you will confidence that Indian rupee is only going to get stronger in longer term (5 – 10 yrs timeframe), which is based on the fact that Indian economy is going to grow much stronger than any other economy of the world (except China). Having said all this, strengthening of rupee brings joy to some, but also despair to many others. I will talk about this in detail in another post soon ! Would love to hear readers perspective on what they think about Rupee future against dollar ! 96% India IT companies prohibit usage of Social Media applications in Office ! So, which ailing foreign cos are Tatas / Ambanis / Mittals going to buy now that the Rupee is rising again? This is a very bad news for software Cos, although I think they have taken great advantages from the rally dollar in the past 18 months. If the rupee falls below 38 then the government will be forced to deliberately undervalue the rupee. Maybe in the future when India gets less dependent on America, a strong rupee will be admirable.